Every country I've visited in Asia has one thing in common: Counter Strike. Whether located in Thailand, Indonesia, China or Korea, Asian internet cafes are always full of people playing Counter Strike. I've walked past closed office storefronts and have seen teams of employees yelling through headsets while playing Counter Strike. And those are the considerate employees! I've even heard that, during office hours, when supervisors are away, the cubicle drones do play. In China, the government is aware of this and has licensed many state-owned media agencies to create their own games to compete. Word on the street is, China, like Korea before it, is entering the world of competitive gaming, with a facility being built in Chengdu that will host, occasionally televised matches between e-gaming professionals. Will they be playing Counter Strike or something else? That remains to be seen. Though it is currently limited to the US, gaming platforms like GetGosu are poised to take these communities of gamers by storm. 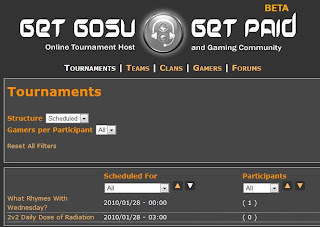 If you haven't heard me rave about this project I've been working on before, GetGosu is an online video game tournament platform that enables gamers to enter automatically seeded tournaments that track stats, and includes anti-cheat controls and an online community for connecting with other gamers. It will eventually allow gamers to earn actual income based on their wins. The name is actually Asian inspired. Gosu (고수) is a Korean term meaning, high hand. It refers to being badass at a game like Counter Strike, Starcraft or Diablo. The Korean word Gosu sounds very similar to the Chinese word GaoShou (高手) from which it was derived and still shares a meaning. This would be great if GetGosu ever expanded to China. We'd barely have to modify the name to work with Chinese characters. [Edit] Joan, a friend who is working on the project as well just read this post and recommended this transliteration, that also retains some of our intended meaning GouGaoShou (够高手). 够高手 roughly means "Enough of an Expert". Since the name GetGosu is meant to convey "Become a Badass", this translation actually works pretty well! [double-edit] Another friend, Jared, recommended GaoGaoShou (高高手). Based on how Chinese works, we assumed 高高手 would mean "very badass". However, I just looked it up and the translation at MDBG.net was: "Please do not be too severe on me!" I think that could work too! If you are based in the US (sorry players in Asia) and would like to try out GetGosu while its in public beta, head over to GetGosu and create an account now. Accounts are completely free and gameplay is hosted on our own blazing servers. If you are based in Asia, sign up for an account but stay patients - closer regional servers will be added soon.